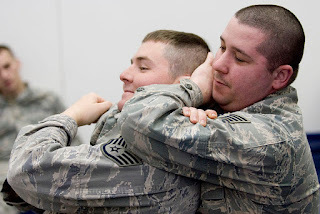 During this post I will be outlining Tips for Instructing or Conditioning Combatives. I have used these with any fighter involved with Reality Based Combat. I have also adapted them to MMA needs where they are applicable. They are outlined here in no particular order however they are some of the most useful tools I have applied for instilling the Techniques, Skills and Attitudes for Combat Effectiveness. These are by no means all the methods I use,and some may seem obvious like suggesting Impact Training, but there are still many who don't use even these methods to their fullest potential. These are just simple areas of Focus you can employ to begin improving your Combative Application. Also known as the "Leadership Room" or "The House of Pain" this is a concept I adapted from the US Marines. For this i do exactly as they do, no need to change a formula that works right? This is perfect for your Combatives Training and Conditioning. Full Contact Techniques and grappling movements are used during these training sessions and each session will also contain "Conditioning Stations". This video illustrates the concept perfectly Leadership Room. If you want to dominate a Combative situation you need to effectively transfer between Ranges in order to close an Opponent. The aim of employing these types of Drills is for each Combatant to run the Shuttle and launch a Combination to close down the Range. One of the best principles you can employ in any fight is to close the distance to most effective and lethal weapons quickly with maximum aggression. Range Transition Drills aim to teach this concept until it becomes a a mentality. One of the favorite principles I apply is to close the distance and employ Knees, Elbows and Head as quickly as possible. This is done for the Psychological impact as up close aggression has its own impact on the Defender and for Maximum Damage. I employ these for simple repetition of Technical Movements. Repetition is needed because there needs to be ingrained sets of Movements and Techniques that transition over to Combat situations without thought of the user. They also need to be adaptable to most Common fight situations.I have found Entry Drills such as this one to be very useful as many fighters across many disciplines cross train in Boxing. These Drills are also used for Practicing Knife Techniques. Combatives Skill needs repetition just as much as any other one, don't neglect repetition of the Basic Movements. As a fan of FMA I would encourage you to find ways to adapt these for your own needs as they can also be trained Solo to maintain some form Technical Skill before Transitioning back to Partner Training. An old instructor of mine used to say in order to hit right you have to hit something because if you don't train by hitting something you wont follow through the Technique. Impact is what he believed was one of the cores of Realistic Training and I always give my Students as much training as possible where they can see as much as possible the real effectiveness of the Techniques they've been learning. One of the Greatest trainers of all time Cus D'amato would have his fighters train on progressively heavier bags to increase Punching Power. This is the case with any form of Combatives Training. Try to use as many different tools for improving your impact Speed and Power as you can. Some bags for example are filled with wool and are particularly Energy sapping to hit. Others like Water bags can also have the same effect. This may be an obvious method of training to talk about, but there are many "masters" who could do with a lot more of this in their programs. Any person familiar with the Basic components of Combative Principles will be familiar with those of Fighting Distance. We discussed training for closing Ranges in an earlier point, but this time I want to touch on the Specifics of Clinching and what that can do for you. The first reason is Control and Comfort. Intense and Repeated training at this Range of fighting requires several key components to be performed under pressure in order to be successful. Arm Control, Balance, and Body Positioning are all major components that Clinch Training will force you to master.One way I have clients train this when fatigued becuase quite simply your fight may come when you're exhausted Physically. The only way to prepare to Fight when in this state is to Fight with Fatigue to force yourself to have the ability, and experience to be able to Survive at Close Quarters. Another Major element is control of the Fight to prevent or control its decent to Ground level. We should all by now know we don't to a dangerous situation on the Ground. With this in mind one the most important training Focuses should be Entry/Exit and Sweep Training. Improve your Sweeps and Unbalancing work and this will allow you to employ the L Principle, which means your opponents will on the ground with you over him for a Finishing Strike. This gives you the protection of still being Vertical and Mobile while controlling the opponent on the Ground. Position:Place yourself in a location where you are aware of and have access to exit routes easily. You can't be hit if you're not there. Never block yourself in. The same for the other Person this applies to not making them feel boxed in. Attitude:Display a Positive, Helpful, Polite but Assertive Attitude. Projecting Confidence in your language and showing you are giving the chance to move the Conflict forward non violently is a great help. Avoid Aggressive Phrases, and Trigger words. Let them know you don't want the situation to end Violently.Keep the focus on the Solution to Problem. Look and Listen:This is an Important aspect of Control. Maintain Eye contact but don't Stare, and demonstrate all signs of listening Actively. Head Nodding Etc.This is also where you observe for signs of Conflict Escalation. -Can you see their feet? -Do you feel Comfortable with the distance? -Will they have to move to hit you? Doing this will ensure you keep a firm control of Space. Should an Attacker continue to invade your Space you employ other Techniques. Stance: Stand to the side Palms open one hand in front one hand slightly lowered. This will be a Guard should you be Attacked, and B by turning you give the Person you face the chance to exit. In the event of a need to Strike your Palms are your first weapon. Open Palm Strikes from this position are your main tool here.To your Opponent this has look like you are almost backing away, but this is the position from which to launch your First Strike. Open palms is all about "I'm going to allow to Speak, and Resolve the Situation. I'm prepared to hit you, but not yet, and when I do it will be the only resolution". There is always two ways to do ways to do something the first is easy where no one gets hurt, but the second is still easy(for you) but someone gets hurt. Open Palms is their chance to decide. The list here is not huge, and you may disagree. However I hope it sparks you to think your own training, and what methods work for you or your clients.